I am an assistant professor in the Department of Anthropology at Wayne State University in Detroit, Michigan. I received a PhD in anthropology and a MS in kinesiology from the University of Michigan in 2011. My primary interest is in the evolution of the human diet, specifically in regards to entomophagy, or eating insects. Researchers who study ancient human diets tend to focus on meat eating because the practice of butchery is very apparent in the archaeological record. In this volume, Julie Lesnik highlights a different food source, tracing evidence that humans and their hominin ancestors also consumed insects throughout the entire course of human evolution. 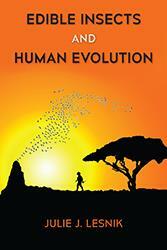 ​I continue to do work in south and east Africa reconstructing the role of insects in the hominid diet. My research has been funded by the American Association of University Women and the Leakey Foundation. Watch "The evolution of insects as food," a 45 minute lecture given to Wednesday Nite @ the Lab, University of Wisconsin-Madison. Watch me present my research using only the one hundred most common words in the American English language, inspired by the webcomic XKCD.